Happy Monday Friends! 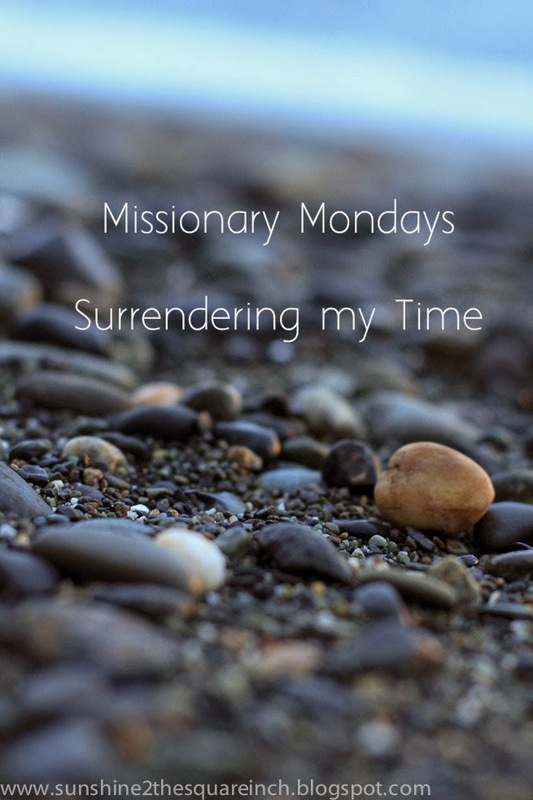 Welcome to week 9 of Missionary Mondays! Missionary Mondays are weekly updates on how God is guiding Dave and I to Myanmar (Burma) & Thailand. We hope these posts will help answer any questions but if you have any other questions please ask! We love questions. If you want to see any of the Missionary Monday posts, on the side bar there is a 'search box', if you type in 'Missionary Monday' they should all pull up for you. Time! I'm kind of protective of my time. In the last few years I've really learned to guard my time and not let my schedule get crazy busy. Along with time I'm also super protective of my sleep. I require a lot of sleep to function. I need at least 8 hours a night, if not more. If I sleep less than that I can seriously be an angry and emotional bear. It's not pretty when I don't sleep and it throws my whole system off. You know what else throws my whole system for a major wacked out few weeks? Jet Lag! Seriously, it sometimes takes me 2-4 weeks to reset my system. When I moved to Korea to teach we arrived at 10pm and the school said we were to arrive at school the next morning to walk around like zombies train. I'm sure we were a sight to behold. ha! One time when I flew back from USA to Korea it was New Years Eve. I got back to Korea around 10pm and went to a NYE gathering with some friends. I got back home probably around 2/3am and then I slept until about 5pm the next day. That's 15 hours of amazing sleep! After I was awake for a few hours I went right back to bed for another full night's rest. I'm a pro, guys! That was probably the fastest I have ever recovered from jet lag but I also did sleep about 20+ hours. When we were planning this trip for Asia I knew I would need some recover time before jumping into ministry. Well, our missionary friends in Thailand e-mailed me and said if we flew in on the 2nd of November we could go into the prison and share the gospel and minister the next day. Ha! I immediately told Dave there was no way I could do that. The panic of jet lag plus lack of sleep didn't sound like the best combo for me. However, I thought I should pray about it and see what God wanted instead of just saying no. I prayed and told God if He wanted us to help that we would. However, when we looked at departure dates, the flights with the best deals flew out on November 3rd which meant we wouldn't be working at the prison, or so I thought. I emailed our friends in Bangkok telling them we would arrive at 10pm on Nobember 4th. I got a reply that encouraged me to sleep on the airplane as they will be taking me to help at the women's prison on November 5th. So, we will arrive into Bangkok at 10pm on Tuesday evening and Wednesday morning I'll be going to the prison. You know what though? I'm super excited! Sure I'll be jet lagged but what better way to start a year abroad than jumping right in to love and share Christ with people? I did pray about my time and told God if He wanted me there I would go and I am sure He does want me there. Also, I'm positive the women there have much bigger problems than lack of sleep / jet lag. If you think about it will you please pray for the women there? Pray that we can minister and encourage them. I do plan on sleeping a lot on the way over. Want to hear my sleeping plan? It's called NyQuil. See, we have a 14 hour flight (Chicago to Seoul) and before we board the airplane I'll be taking NyQuil. I'll fall asleep in Chicago and wake up in Asia! Walaaa! I've done it before and it is marvelous! Don't get me wrong, I'm still jet lagged for days but that extra sleep does help. What are your sleeping habits like? Has anyone else helped serve in prison ministries? PS - We are headed to Boston today! I've been updating on my Instagram and Facebook. I hope you'll stop by. I need my regular 8 hours of sleep a night, too. I wake up early, but I always fall asleep early in the evenings. I've always been able to sleep well on planes, though. The Nyquil trick is a good one--that stuff puts me out like nobody's business! Chicago to Seoul is a nice flight!!!! That's the route we have taken 3x now. I am right there with you, girl! I need at least 7 hours of sleep but prefer 8. Anything less than 7 and I'm groggy, crabby, and get a headache. No fun! PS We are going to S. America and I just invested in one of those neck pillows - hoping that helps my 'I don't sleep on planes' habit! Maybe it is a girl thing with the 8 hours. Most guys I know don't need as much. Amen to NyQuil! That stuff is a life saver and it really does put me in a comma like state. I took Chicago to Seoul the first time I flew to Korea. It was super nice and Asian Airlines is hands down waaaay better than American Airlines. Who did you fly with? Thanks for the prayers! Me too! I just can't function without 8 hours of sleep and then I feel bad for everyone around me. I will have to try that. I'm terrible at not napping though. When a sleep wave hits me I'm out BUT I'll be at the prison working so I don't think I will want to fall asleep there. Those pillows are nice but I have yet to invest in one. This is really crazy but I used to take a big pillow and a big blanket. I'd put my food tray down, smash the pillow on it and cover my whole body and head with that blanket. I for sure slept that way but I'm not going to do that this time because of limited carry ons. Also, I know you like essential oils. Is there one that would help sleep? I have no idea how essential oils work but that might be an option. 14 hours? Oh man that's rough. When we flew to Greece we had a 10-hour flight, and I thought that was bad. Maybe I should have taken NyQuil... I'll be praying for your prison ministry! NyQuil is brilliant! Do you have any tips for actually sleeping on a plane besides that? Do you have one of those little travel pillows (that look like a little bean or something)? I just can never get comfortable but I think I might bring NyQuil. When I was doing a medical trip in Haiti, some of our group members went to do some checkups and things at the local prison. Although I was assigned to a different location, the stories I heard from the people who were at the prison were both eye opening and heart breaking. So great that you'll be able to jump right in, can't wait to hear about your experience! 10 hours is long too! I think just about any trip with crossing major time zones makes it longer because your body feels so weird at first. You should try the NyQuil next time you take a long flight. It's amazing! That's super neat that you got to do prison ministries! I'll be sure to read your post, it's always neat to read about things like that. Here is what I used to do to sleep. I looked ridiculous BUT I would get a big pillow and smash a blanket into the pillow case as well. Then once the airplane took off I'd put the eating tray down, put the pillow on top and then wrap my whole body, including my head, with the blanket. That was the only way I could get comfortable. I'm sure I looked absurd but I never cared. I haven't done that as much because of carry on limitations but I might try that for Asia this time along with the NyQuil. That's good that your team members got to go to the prisons in Haiti. So many people need encouragement there. I really have no idea what to expect by going to this prison but I'm sure it will be eye opening. I can just imagine you sleeping like that! And hey even if people think you look funny, they're probably mostly jealous that they're not sleeping as good as you are :-) I'm excited to hear about how things go in the prison for you, it is such a need, even here in America.